A short trip to Cancun to remind me that there is other cuisine out there! Some of the things that the “traditional” food served to us used I didn’t like at all – there was an overabundance of corn! Every meal was served with corn chips or corn tortillas. I would get strange looks from the waiters when I would order something “sin maize,” (meaning without corn) as though I was suggesting that the food would simply not be acceptable like that! Usually there was no further discussion when I calmly explained that “tengo un allergio de soya, trigo, y maize” (I’m allergic to soy, wheat, and corn). But I was definitely classified as strange in their eyes. I mean, how can anyone live without corn?!? I manage quite well, thank you. But, as I was hoping, I did pick up a few tips and tricks from their food. I came back with an arsenal of new ideas, based on the food that was served to me there, and I can’t wait to try them! Even more exciting, there were a few things I tasted which were totally new to me, and I’ll be attempting to replicate them myself. So keep your eyes peeled over the next several weeks for some new recipes from me! First chop the rutabaga. Add the chopped rutabaga and coconut cream to a soup pot to boil down on high heat. This will take some time, since the rutabaga needs to soften before you can mash it. This is why we’re using coconut cream rather than coconut butter: the coconut cream can cook down with the rutabaga, lending it’s taste to the final product, and helping to ensure that the mash doesn’t stick to the pan. Stir this regularly. As soon as the rutabaga is in the pot, prepare the steaks. Add the steak to a frying pan with about a half-teaspoon of coconut oil (steak will supply most of what it needs to cook itself), but don’t turn this on yet. Now slice the ginger. Make sure the slices are thin, as you will be cooking the steak with them on, and eating it that way! You can dice the ginger for the rutabaga at the same time, saving a bit of prep work along the way. Add the diced ginger to the rutabaga immediately. Once the ginger is sliced, carefully distribute the slices across the top of the steak, and begin cooking. Grind the pepper over the top of the ginger and steak. This should be cooked on medium-low heat, covered, for about 15-20 minutes. Cook time will vary based on your preference for how thoroughly cooked you like your meat, as well as the thickness of the steak you are cooking. The steak will be cooked on only one side. It’s important to keep that in mind, and one of the main reasons this needs to be cooked covered. This will allow the juices of the steak to leak out of the top, keeping the ginger integral to the cooking process. Just before the steak is done, mash the rutabaga with a potato masher. Once mashed, stir it again to check the consistency and make sure that it’s the right thickness for you. I like my mash to be thick, but remember: the mash gets thicker as it cools, so keep that in mind when you’re deciding if it should be cooked longer. Slice and serve the avocado first. Then add the steak, and last add the mashed rutabaga. I add the rutabaga last because it will thicken as it cools, so it’s best to serve it hot, right from the pot. 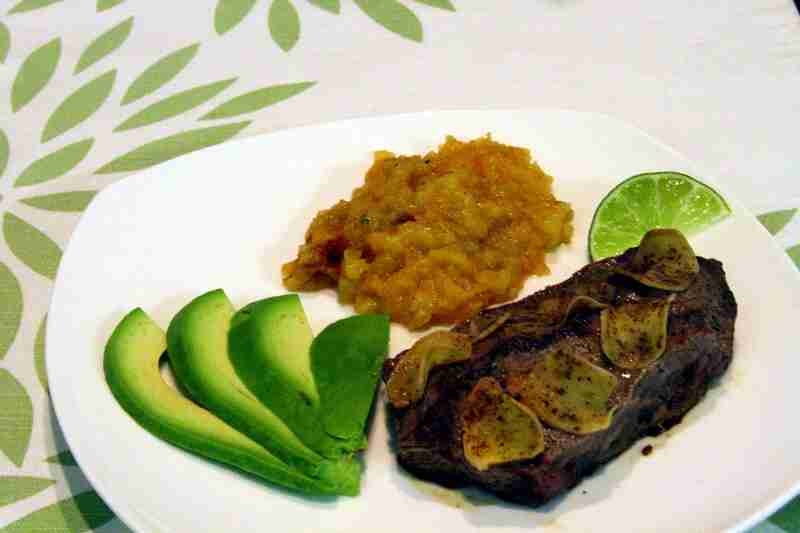 Finally, take the half-limes and squeeze them over the steak, getting just a little bit of the juice on the mashed rutabaga. There should be enough lime juice on the steak that it’s running over the sides of the steak and pooling below it. This is just right, and will taste amazing! For more “What’s For Dinner?” posts, meal ideas, and recipes, keep tuned! How do you make your lime-steak? Do you marinate it first? And if so, what do you use to marinate? How do you add the spice to it? Do you use hot peppers? Or something else? Let’s hear about your Ginger Lime Steak in the comments! I cooked rutabaga (or swede, short for Swedish turnip, as we call them this side of the pond!) for the first time on Sunday – grated and sauted in bacon fat, so good. Was just pondering whether to buy another one to eat tonight and stumbled across your blog – serendipity! Thanks for the comment! Rutabaga is a great “blank slate” for rich flavors like your bacon grease, or the coconut butter in this post! It’s own flavor is simple and subtle, and it combines really well with the rich flavors that us Paleo people love. I use it a lot when I want something simple, easy, good for me, and picks up the flavors I am using well. ← Guest Post Is Up!